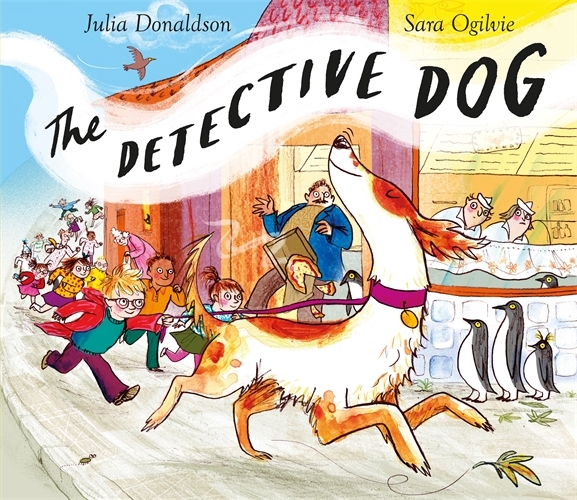 Nell is a detective dog. She has an amazing sense of smell (Sniff, sniff sniff!) and it helps her solve mysteries. Whether it is a missing toy, item of clothing, or a strange smell, Nell will ferret it out. Nell is also a listening dog. She loves to listen to stories, and visits the school of her owner, Peter, every week to hear the children reading, with the bonus of all the lovely smells to be found at school: food, furniture, and especially books! The Detective Dog is an action-packed, rhyming story from the fabulous Julia Donaldson, author of the popular story The Gruffalo, and illustrated by Sara Ogilvie. It’s sure to be a hit with young readers and their families who will enjoy joining Nell, Peter and his school mates as they journey around home, school and their town.